Last year I bought a pack of mixed hot pepper seeds, four different types. I got them to germinate and start off, soon after they were gone. Maybe I should start one more batch. Today I was able to collect seeds from my ‘wild’ catnip and red clover. It’s been a pretty good year seed wise. Maybe it’s nature’s way of saying better luck next year. On the bright side, my bamboo’s new shoot is now about 2 feet long. From morning until later afternoon it grew 2 new branches out the side of the new shoot. Apparently it doesn’t seem to mind this weather. My basil seems to be thriving in this heat, and my sage has been growing like the invasive plant it’s supposed to be. Somehow there’s a sage plant now growing in the same flower pot as my mint. It’ll be interesting to see how two invasive plants in the same pot co-exist. I have other pots with only mint and sage, so I’ll let the mixed pot do it’s own thing and see what happens. Hi! Thanks for leaving a comment on my blog! It’s always nice to meet other gardeners in the NYC boroughs. I don’t grow cucumbers in containers, only in the ground, so I don’t know how well they do. I’ve had cucumbers in the ground taste a little bitter, I think it happens when the cucumbers have irregular watering. I’ve been trying to water them on a schedule. I would love to do some kind of get together as you mentioned for a seed exchange. I am saving heirloom tomato seeds this year. Please do include me on the list. I had about twice as many pepper plants last year. Cayenne, habanero, jalapeno. I tried to save the seeds (without really researching how to do it/what that involves), and plant them this year. Nothing really took off (maybe one but I got impatient with it and gave up). Out of curiosity – and because I had the extra space in my tray – I also threw in some bell pepper seeds from a regular old bell pepper I bought at the store (organic of course). I was curious what would grow. Over the winter, I brought the plants inside. 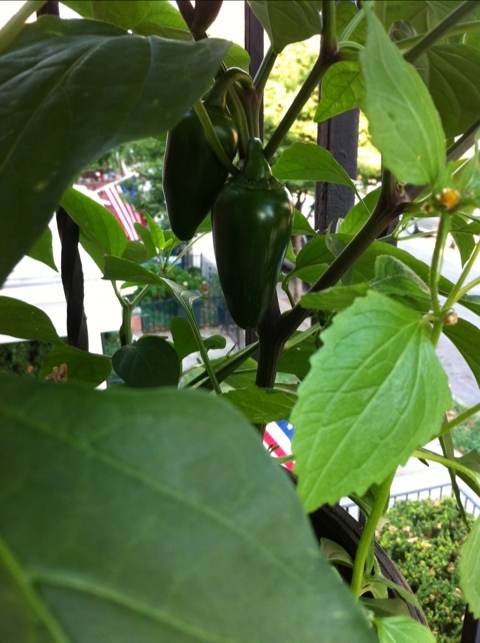 The cayenne survived, as did one jalapeno plant, although it’s taken a bit of coaxing to get them to produce this year. The cayenne you see in the pics is one that wintered inside. The jalapeno is actually the old jalapeno, along with a new plant I bought at the nursery to use the space (once I put it in, the old jalapeno started growing new shoots). I also have a small pepper that I’m not quite sure what it is. Looks like a cross between a purple bell pepper and a habanero. After listening to a recent podcast on peppers and finding out that they can cross-pollinate and leave you with hybrid plants, I suspect that’s what it may be, since I did put various seeds together in the same planter, just curious whether they would grow at all. I’ve been reading/listening more about saving seeds. There’s more technique to it than I realized. What’s your approach? Also, do you keep your basil inside through the winter? I’m planning on it this year but haven’t done that in NY before. Let me know what’s worked for you. I’ve keep basil inside through all of last winter and it grew quite large for a fairly small container. Up until nearly this summer it provided a couple nice leaves daily. The plant was so productive that I transplanted into the yard where it is producing seeds as we speak. In the same small container as that basil plant were 3 scallions which did well through the winter, but by summer their production slowed down. Those are also in the ground, but not too productive. The container I had the basil and scallions in was clear glass (no drain holes) and only 4×10 inches, 4 inches deep. The clear glass helped not to overwater it. So far I’ve collected seeds from my basil, catnip, scallions, sunflowers, (which I think the birds got at), and strawberries. When I get a chance there are red clover seeds ready to collect too. I think the stress on the plants made them produce seeds early. Seeds from dry stuff like flowers you can just collect when the flowers get ‘crisp’. Things with pods like arugula you wait until the pods turn brown and hard, then save the seeds inside. What I didn’t know until recently was that ‘wet’ things like tomatoes and fruit should be collected with the ‘goop’ they’re in and allowed to ferment a few days. Then you clean them and let them dry. Supposedly that helps to stop transmitting any plant disease to the next year by fermenting. I’ve saved seeds without the fermenting thing and that seems to work too. Jason at the SSG says he just leaves the fruit on the vine until it falls to the ground- as it works in nature. I like Jason’s natural approach to things. Me too – my approach seems to be in synch with Jason’s as well. (For him it may come from years of experience, from me it’s part inertia, but, hey, whatever works). How did the clear glass help to not over water – just b/c you could keep a better eye on it? As far as watering, I’m working to check the plants more often, as I think the lack of water + the awful heat spell we had is what did in my carrots (that at one point were too phat to thin). I’m making sure to stick my finger in about an inch and just make sure it’s not dry at that level. However, I do have a lot of container plants – 14 in the front yard alone and counting just off the top of my head. I do work a FT job, so it’s going to be hard to keep up such diligence. Just curious about how much time/day you would say you spend tending garden? That’s it with the glass, I could see if water is filling up in the bottom. I didn’t plan it that way, the container happened to be clear glass. I don’t have nearly as many containers as you. Based on a couple days I had to water mine, I seem to use about 1 1/2 maybe 2 gallons of water in the containers per day. Some days I water the containers a little less, but twice. For the ground I’ve noticed that if you pull up a weed or two (I’ve got lots to spare) you can tell how dry the ground is. If the roots pull up dry soil, it’s dry. Usually I just look at the color of the soil. If it’s dark it’s still moist. As it dries out the color changes to a light tan. I used to spend about an hour outside, mostly to get a little fresh air and sun. Lately it’s probably closer to 30 minutes. The ground doesn’t need much attention, the containers do. How often do you water the ground? I do mine maybe once every 3 or 4 days depending on how hot it is. The containers are watered daily. If all your containers are kind of close together maybe some sort of automated system may help. I am still waiting on a catalog to do more research. If you water the containers with a can, try to get an idea of how much water they use per day.